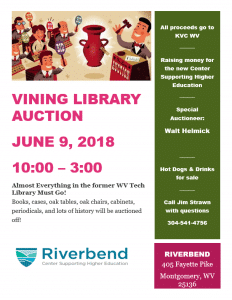 KVC-WV, which purchased the former WVU Tech, is having an auction/sale of items in the Vining Library on Saturday, June 9th from 10:00 a.m. – 3:00 p.m. The new name is Riverbend: Center Supporting Higher Education. Through a 25-year lease purchase agreement, KVC took possession of the furnished facility in July 2017 and immediately began repurposing the campus into a fully-capable educational environment with subtle wraparound supports to create a safe, nurturing environment for young adults transitioning from the foster care system. Almost everything in the 4-story Vining Library needs to go. Books, Bookcases, Tables, Chairs, Cubicles, File Cabinets, End Tables, Periodicals, Card Catalogs, etc will be auctioned off to the highest bidders. All proceeds go to KVC WV and their new program at Riverbend. Walt Helmick, former WV Agriculture Commissioner will be on hand to provide his auctioneering skills. Perfect for collectors, librarians, small business, community centers, churches, etc. Also a great opportunity for WVU Tech alum looking for a piece of their history. Lots of gems and treasures hidden in that library. Spread the news and join us. Address is 305 Fayette Place, Montgomery, WV on campus.